Today, RBELL Medical has entered the practice of hair restoration, a field that’s not always delivered optimal results for patients. With The CleoPen aesthetic device from RBELL Medical, trained practitioners can stimulate follicle growth via a combination of proven methods. “Hair restoration is one of the most in-demand treatments today,” says RBELL Medical CEO Rebecca Bell. “And it’s not exclusive to men, either. Women account for about 40% of hair loss cases in the U.S., according to the American Hair Loss Association. Among the most promising hair restoration treatments today is PRP. An increasing number of aesthetic medicine experts are seeing the value in PRP, a technique that began as an orthopedic and sports medicine treatment alternative. Moreover, PRP can encourage the development of the hair canal, control hair growth and follicle size, stimulate increased growth by prolonging the growth phase, and increase the diameter of hair shafts. Healthy growth is further supported by an increase in small blood vessels surrounding the follicles. The Nava Health & Vitality Center and The Carolina Men’s Clinic are therefore only the beginning of a major shift in how hair restoration is done. 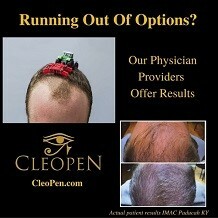 RBELL Medical’s CleoPen allow for affordable procedures that are proven to work, with financing options designed to provide options to anyone interested in once more having a full, healthy head of natural hair.